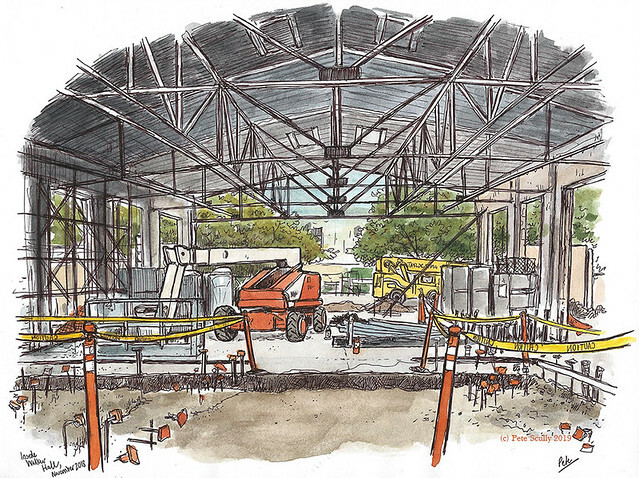 Some of you may recall that I enjoy drawing the in-progress construction (and deconstruction) of buildings on the UC Davis campus. 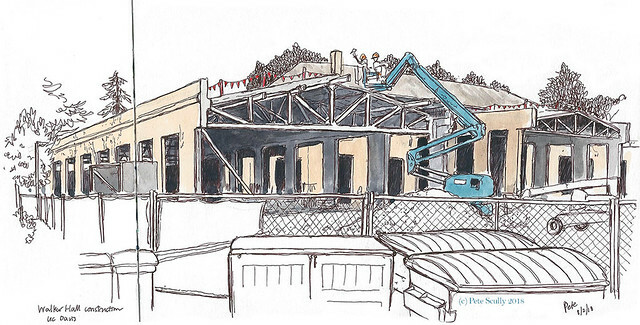 For example, the construction of the Manetti Shrem (completed 2016), and the long removal of the Boiler Building and replacement with the Pitzer Center (also completed 2016 – see the sketches from that project in this Flickr album). So when I was told a few years ago or so that the empty Walker Hall, a historic E-shaped building in the middle of campus, was going to be completely reconverted to house the new Graduate Center, I was super excited. 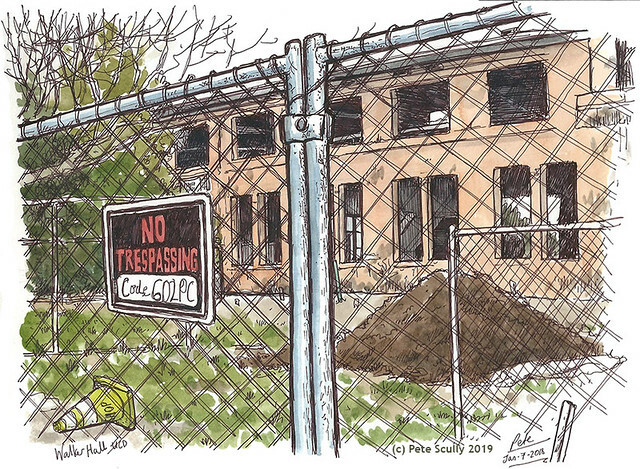 I’m a big advocate for graduate studies on campus so am pleased they will be getting a modern new space, while still reusing an existing building. 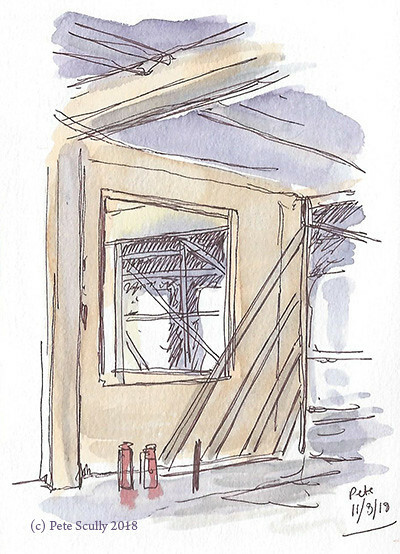 I started sketching the renovation already back in May, and drew it quite a few times in its previous dormant state, but this summer the real work began, so when I got back from Portugal I took the sketchbook over and started sketching from the outside. As you can see, the whole building is empty now, leaving the shell. 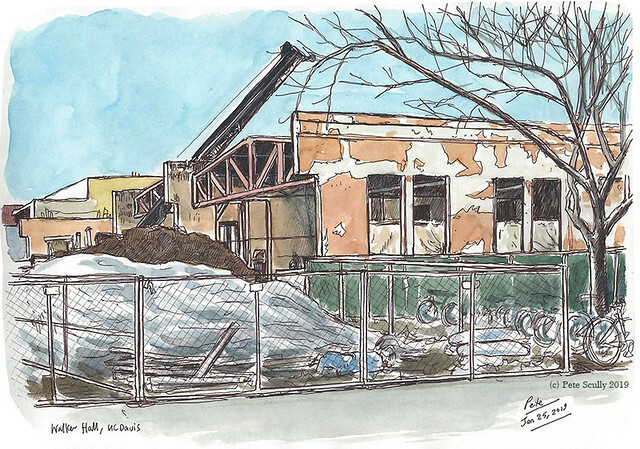 It looks like the wings at the rear of the building will be slightly shorter than they originally were, but that is where the largest degree of change will happen, and will be completely modernized – the front however won’t look too different. 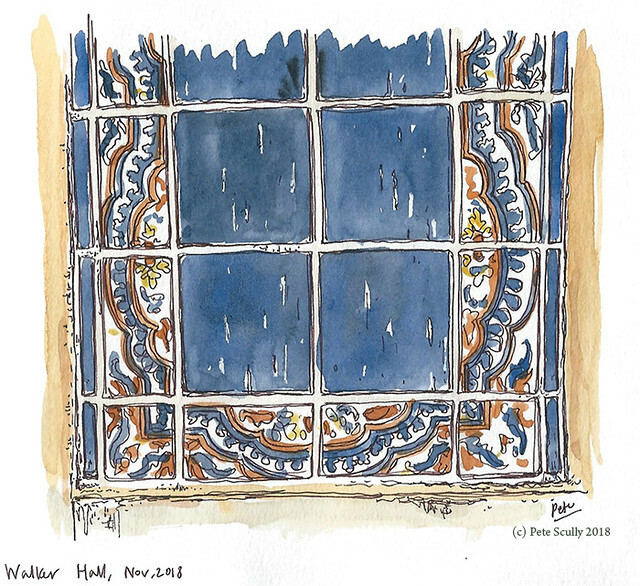 Above and below, sketched from the side closest to the Shields Library. The Graduate Center will be located in between the Shields Library and the Student Community Center. 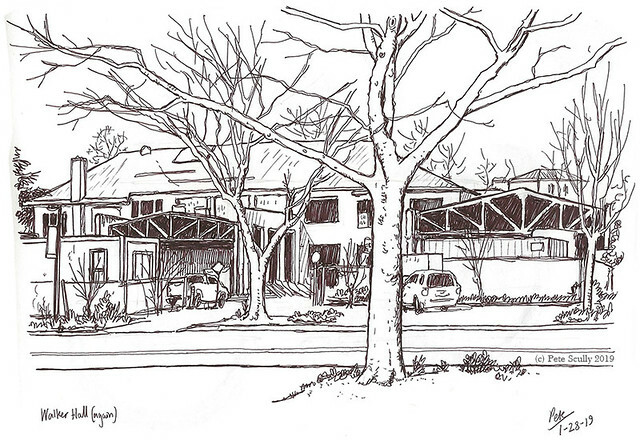 The most recent sketch I did is below, stood across the street outside Everson. 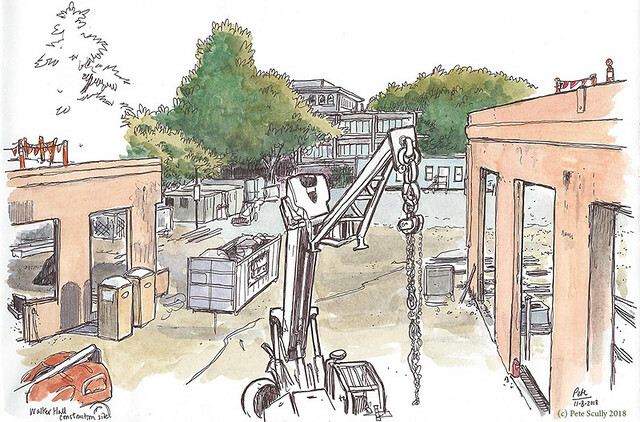 It’s hard to see a lot of the building because of the trees and trailers in the way, but it’s a hive of activity. I’m looking forward to sketching some more as the year goes on. It’s expected to be completed by Spring 2019. 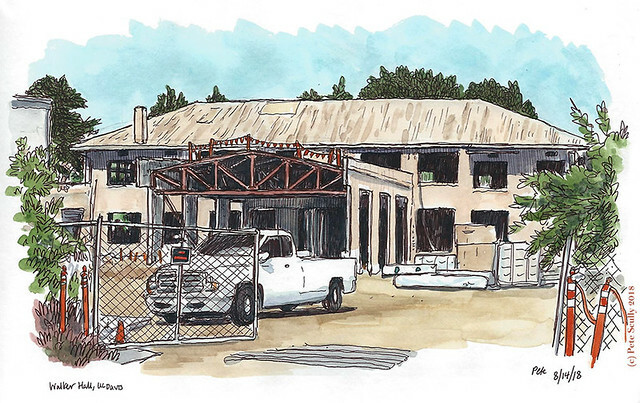 You can find out more about the Graduate Center at the Grad Studies website, and also at at the Design & Construction Management site. 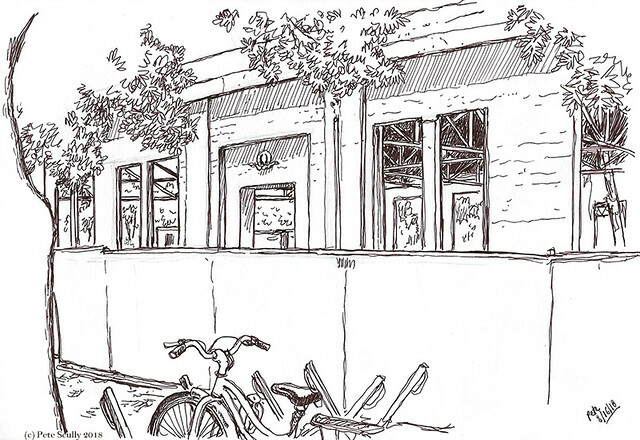 In July I started a new sketchbook, a long panoramic accordion Moleskine sketchbook, with the intention of doing some very long drawings on the UC Davis campus. 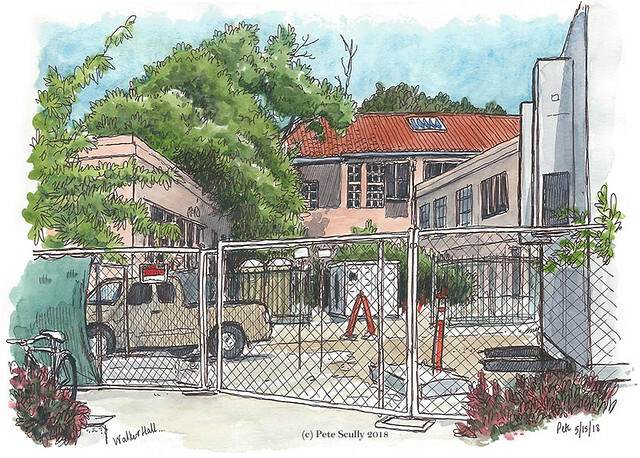 As it turned out I managed three scenes, all on the same street (Hutchison Drive), though only in pen with a dab of colour here and there. If you click on the image above, you will see the whole thing in closer detail. Below, I’ve cut the three scenes down – still too long to see, so click on them for a closer view. 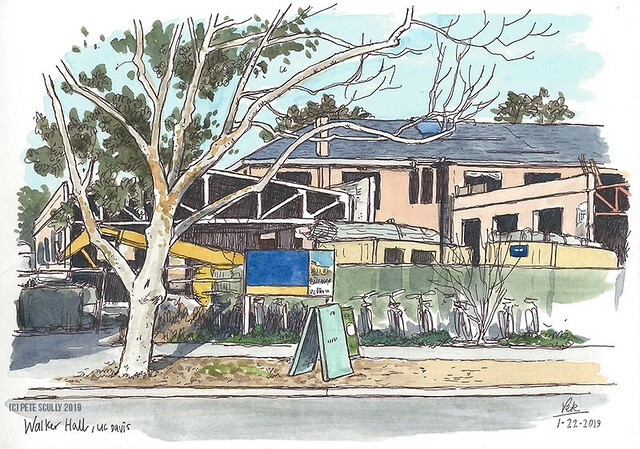 First of all, the new Pitzer Center, still under construction in this sketch, on the left. A good place to start! Then, the Music Building, followed by Wright Hall and the Art Building. Good place to stop. Next up, the Silo complex, also under reconstruction. First of all you see Rock Hall, the Chemistry Building’s lecture hall. 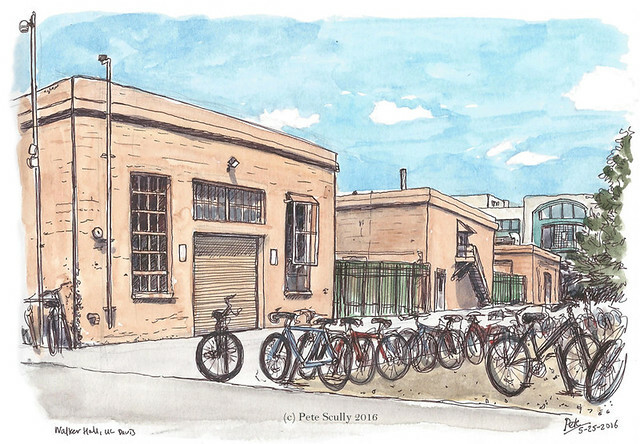 Next up, the back of the Bike Barn building, this side has been various things since I have been here, and I’ve sketched it many times. This whole area is being rebuilt and improved at present. Next up is the Silo itself, where I often eat lunch. 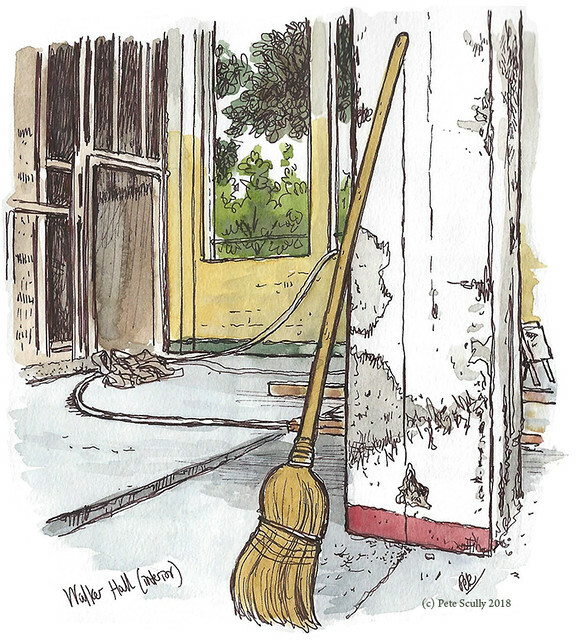 I stopped once the sketch got across the street, where the Silo Bus Terminal is, and drew a tree as a dividing line to the next part. This sketchbook will actually be on display along with many more sketchbooks in my upcoming exhibition, “Conversations with the City“, at the UC Davis Design Museum in Cruess Hall from Sept 19 to Nov 12. If you’re in town, do come by to see it! 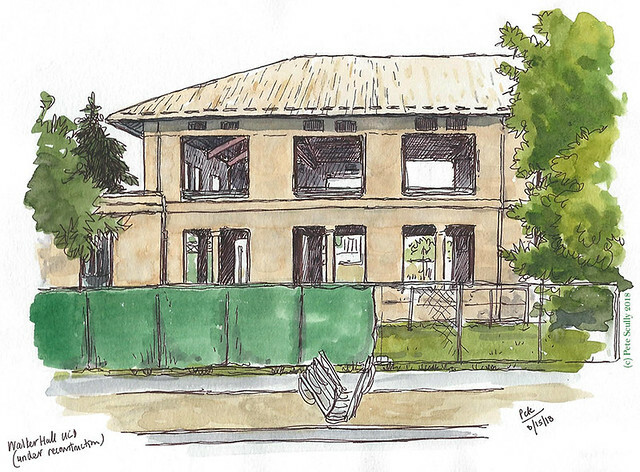 This is the back of Walker Hall, which will be redeveloped into the Graduate and Professional Student Center at UC Davis. The basic “E” shape of this building will remian and the front will be pretty much as it is now, but the interior and much of the rear will be radically altered. I am therefore planning to sketch it a few more times before the winds of change blow in. It’s not really used for much these days so a change is on the cards – another one. I remember when there were other walls in front of these, with cacti all along them, and then when they redeveloped this stretch of campus they opened this up into the walkway you see now. This will in fact be opened up further creating a corridor all the way down to the entrance Shields Library (visible in the distance there). 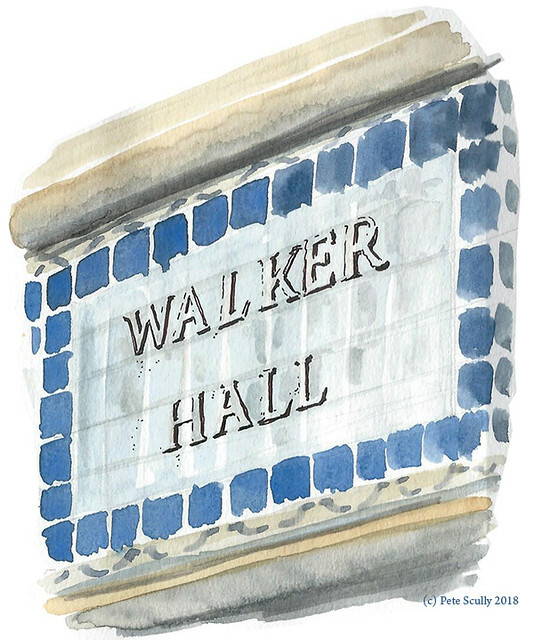 Walker Hall was named in 1959 after H. B. Walker, who was chair of the Agricultural Engineering department. One of the things they will have in this new center are rooms that can be named after people (faculty, I presume). 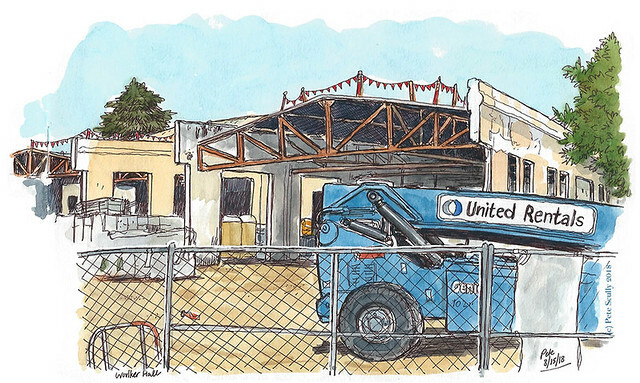 More information about the new center can be found on the UC Davis Graduate Studies website. 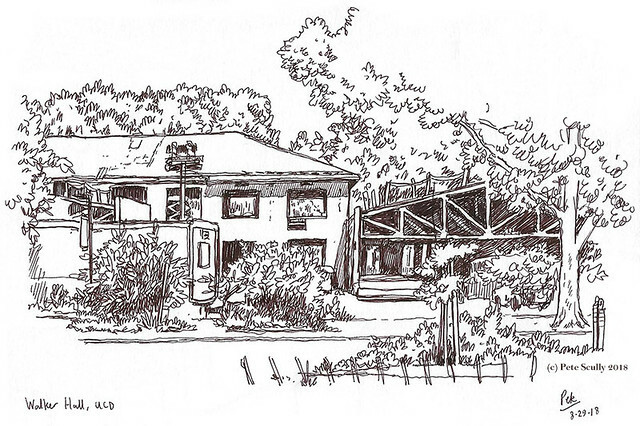 I drew this one lunchtime this week, while listening to the History of Rome podcast.